Microsoft updated its SkyDrive app for PC desktops that lets you pick specific folders to sync with your computer instead of downloading all your SkyDrive files at once. The new option is meant to make it easier to access only the folder you need when you're using a device with limited storage, such as a Windows 8 Intel-based tablet or a MacBook Air. The rest of your SkyDrive files and folders remain in Microsoft’s cloud drive and can be downloaded as required. The updated functionality works with Windows 7, Windows 8, and Mac OS X PCs. A new SkyDrive option lets you sync specific folders, rather than all or none. New users who download the new SkyDrive app will be prompted to either download and sync all folders or selectively choose the documents they want. Current SkyDrive app users will get the new option in an update. 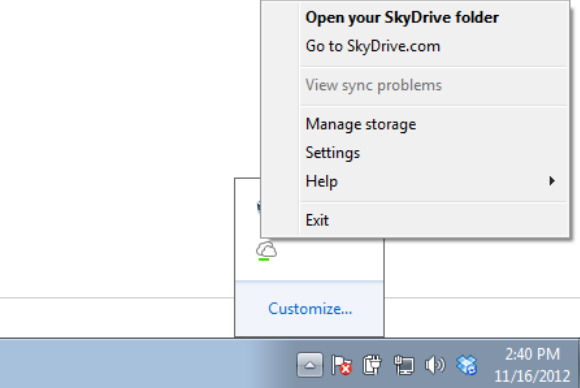 Once you have the new version of SkyDrive for the desktop, you can change which folders you want to sync at any time. To get selective on Windows 7 and 8, right-click on the SkyDrive app icon in the System Tray located in the lower right area of your screen. Then, in the pop-up menu, select the settings option. In the new window that appears select the “Choose folders” tab and then click the “Choose folders” button (redundant? Yes, but that’s Microsoft for you). A second window will pop up with a Modern UI look that lets you choose to sync and download all SkyDrive content, or sync only selected folders. Unchecking a previously downloaded folder will remove that folder and all its contents from your PC, but the data will still be saved online in SkyDrive. 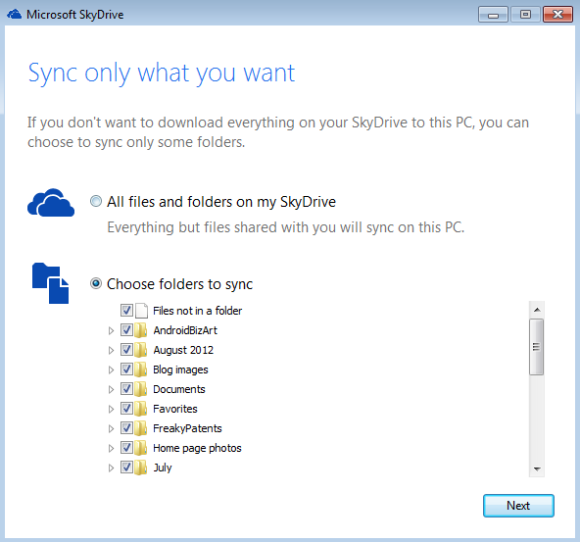 SkyDrive’s selective sync feature is based around folders; you don’t have the option to sync a select set of files inside a folder and leave the rest of the folder's contents in SkyDrive. The same principle applies to any files that are not saved inside a folder. You must sync all of the loose files or none of them. You can, however, decide to save only certain sub-folders to your desktop. Say, for example, you had a Documents folder and three folders named September, October, and November inside Documents. You could choose only to sync SkyDrive>Documents>November to your PC and leave the September and October folders in the cloud. Despite introducing the service in 2007, the SkyDrive desktop apps were only released six months ago. The apps were designed to make Microsoft’s cloud storage solution a more viable competitor to services such as Dropbox. Microsoft that since it released the SkyDrive apps, the amount of data saved to its cloud service has doubled.